Mackenzie Skapski was all smiles during his win against the Buffalo Sabres on Friday night, reaching the NHL despite nearly having his hockey career cut short at the age of 15. Photo courtesy of Getty images. 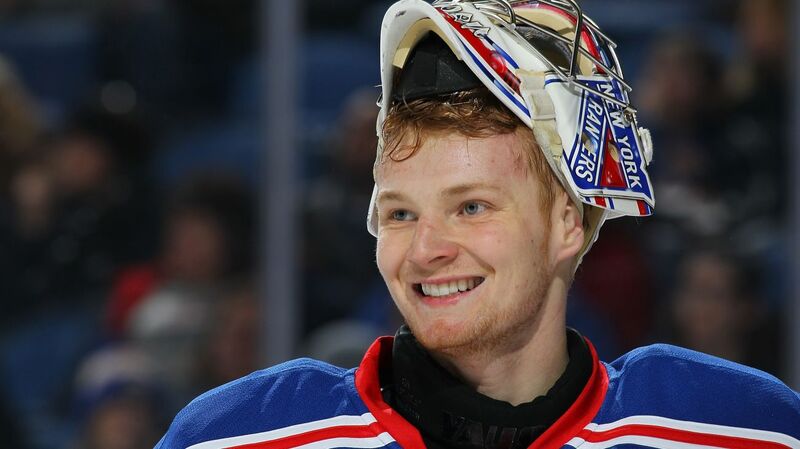 On June 15, 1994, the day after the New York Rangers defeated the Vancouver Canucks in Game 7 of the Stanley Cup Finals, Mackenzie Skapski was born to parents Denis and Tracey in Abbotsford, British Columbia in Canada. By coincidence, Skapski would later be drafted by the New York Rangers, starting this season with the Kootenay Ice of the Western Hockey league. Although he was hardly expected to make the AHL, let alone the NHL, Skapski made his NHL debut against the Buffalo Sabres on his dad’s birthday, and earning his first career win in the process. But it was a long and tumultuous journey for the 20 year old, a journey that nearly saw his hockey career cut short on the drive back from a game. At the age of 15, Mackenzie Skapski was living and breathing the sport like many other young hockey players at his age. He was a talented goalie for the Fraser Valley Bruins, a midget hockey club based in his hometown of Abbotsford, B.C. He was a very promising, up and coming goalie prospect in Western Canada. But all of that nearly came to an end on December 11th, 2009. The Fraser Valley Bruins’ team bus hit a patch of ice on the highway, causing the driver to lose control of the vehicle, spinning out of control and tumbling down a hill. All 21 of the players were sent to the hospital, but the most serious injuries were sustained by Skapski. Skapski fractured his orbital bone, which is the bone cavity containing the eyeball and its associated nerves and veins, as well as breaking his nose. He also required surgery to remove a blood clot near his brain. Despite all of the adversity, Skapski recovered following five months of rehab, and was back on the ice in less than a year. Since his development was delayed, he did not advance to major junior hockey until 2011, where he joined the Kootenay Ice of the WHL. Mackenzie Skapski started his professional hockey career with the Kootenay Ice of the WHL, spending four seasons with the club. Photo courtesy of the CHL. In the sixth round of the 2013 NHL Draft, with the 170th overall pick, the New York Rangers drafted Mackenzie Skapski, beginning his journey to the NHL. Skapski’s junior hockey years with the Kootenay Ice were valuable according to the 20 year old net minder, as he was able to start 65 games in the 2012-2013 season, and another 53 during the next season. In the 2012-13 season, Skapski finished with a 34-25-1 record, along with a 2.78 GAA and a .910 save percentage, registering a total of seven shutouts. The 34 wins and seven shutouts were career highs, and he was tied for first in the WHL in shutouts. Last year Skapski posted a 28-20-4 record with a 2.70 GAA and a .916 save percentage, with one shutout. His goals allowed average and save percentage were career bests, ranking sixth in the WHL in save percentage, tied for seventh in wins, and 10th in GAA. Skapski carried that calm, cool and collected demeanor to the Greenville Road Warriors of the ECHL to start the 2014-15 season. He started just one game there, and was called up to the Hartford Wolf Pack to replace David Missiaen, who was demoted. Skapski quickly found himself in the AHL, finding success and showing improvement with the Hartford Wolf. Photo courtesy of the Hartford Wolf Pack. Skapski was the backup to Cedrick Desjardins, a veteran AHL goaltender who was expected to be the Rangers third goalie for emergencies. 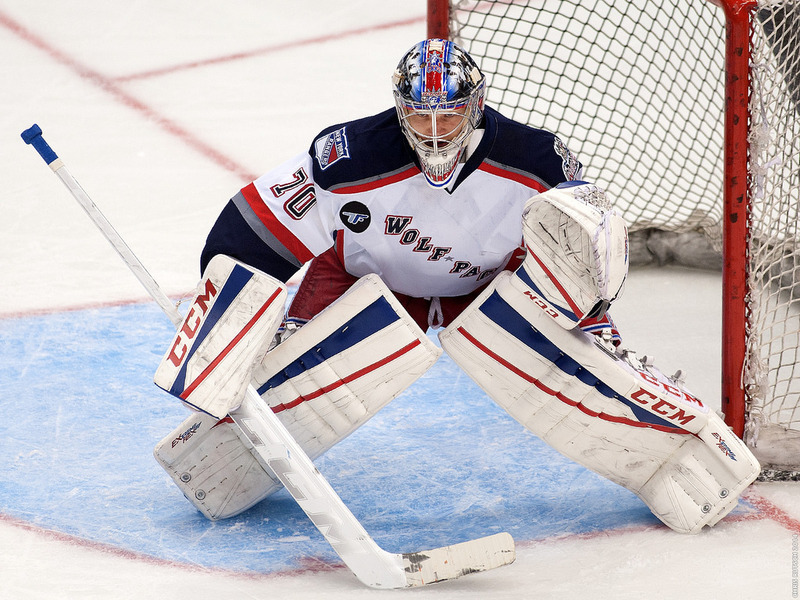 Skapski started well with the Wolf Pack, posting a 2.19 GAA in his first seven games in the AHL. He began eating into Desjardin’s playing time, but would eventually begin getting even more starts following Desjardin’s torn ACL injury. Skapski played well there, splitting playing time with a few other goalies, and showing good progression according to the Rangers staff. In 24 games with the Wolf Pack, Skapski posted a 12-7-3 record, along with a 2.38 GAA and a .914 save percentage, a nice improvement from his WHL statistics. Skapski was expected to finish out the season with the Wolf Pack. 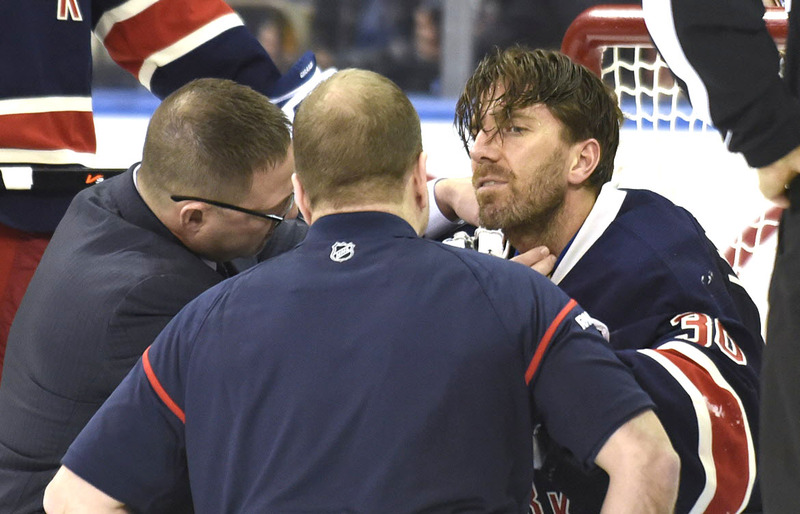 On January 31st, when the Rangers were playing the Carolina Hurricanes, Henrik Lundqvist was struck in throat with the puck, causing him to writhe in pain on the ice, staying down for a few minutes. Amazingly, he finished the game, allowing just one goal in the win. 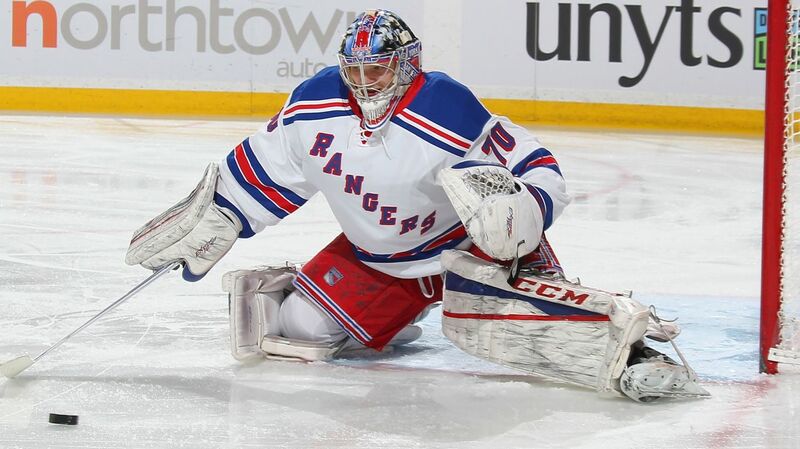 Lundqvist started the next game as well, making 36 saves in a 6-3 Rangers victory. After Henrik Lundqvist was hit in the throat with a puck, doctors discovered a sprained blood vessel, sidelining him for an indefinite amount of time. Photo courtesy of Bill Kostroun. So it came as a surprise when it was announced that Henrik Lundqvist was not going to be available for the game against the Boston Bruins on February 4th, and Cam Talbot would start in his place. The Rangers needed an emergency backup, and Mackenzie Skapski’s name was called upon, joining an NHL team for the first time in his career. Henrik Lundqvist was out for an indefinite time with a sprained blood vessel, and Skapski watched from the bench while Cam Talbot started the next eight games for the Rangers, posting a 5-1-2 record in the process. Skapski got some valuable practice with Rangers goalie coach Benoit Allaire, as well as practicing with the Rangers team. 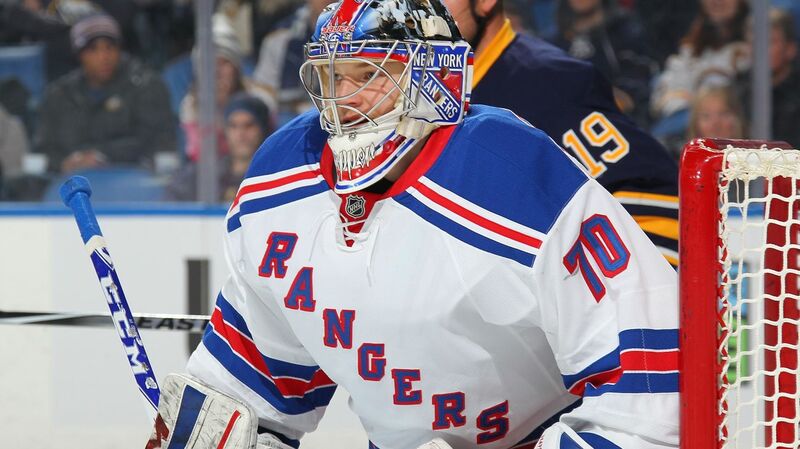 Last night, with the Rangers playing the second game of a back to back against the Buffalo Sabres, it was announced that Mackenzie Skapski would make his NHL debut in net for the Rangers. Cam Talbot had allowed nine goals in the last two games, and needed some rest, especially due to the fact that it was his first time in his career starting more than three consecutive games. After starting the season in the ECHL, Mackenzie Skapski made his NHL debut against the Buffalo Sabres on Friday night. Photo courtesy of Getty Images. The game did not get off to the start that Skapski and the Rangers had planned, when Matt Moulson scored just 14 seconds in following a Rangers turnover. You would think that a young goaltender would be rattled, but Skapski impressed everyone by bouncing back flawlessly from the goal, shutting out the Sabres for the remaining 59:46. That he was, as he stopped the next 24 shots he faced to pick up the win. Skapski didn’t get a ton of work in the first two periods, facing just 12 shots, but stopped all five shots he faced on a Sabres power play in the third period, and making 13 saves in the final 20 minutes. It really was impressive to see Skapski bounce back and play with poise after a horrid start to the game, a situation that was totally out of his control. He settled in nicely, playing his angles well, not overcommitting to anything, and keeping his emotions in check to secure his first NHL win. Mackenzie Skapski settled in nicely after the opening goal, making 24 saves en route to his first career NHL victory on his father’s birthday. Photo courtesy of Getty Images. His fluid transition to the AHL and his rebound in his first NHL start speaks to his demeanor, and is one of the reasons that he was able to overcome the trauma and adversity of the bus accident. “It was tough, but those things happen to people,” said Skapski. “I think everything happens for a reason. I’m here now. That incident, if it didn’t happen, I wouldn’t be in this organization. So things worked out. It was a great night for the New York Rangers, for Makenzie Skapski, and for his family, reaching the highest level of professional hockey, and winning in his first career NHL start, a dream that many athletes never get to experience. Posted on February 21, 2015, in In the Crease and tagged Alain Vigneault, Cam Talbot, Henrik Lundqvist, King Henrik, Mackenzie Skapski, Madison Square Garden, MSG, New York Rangers, NHL, NHL 2014-2015 Season, NY Rangers, NYR, Rangers, Rangers Nation, Rangerstown, Skapski. Bookmark the permalink. 2 Comments.